Among the children of Johannes Sechler (1701-1761) were three sons listed below. Abraham, Theodore Frederick, and Rudolph Sechler were brothers. Under each are the following generations significant to the Sechler family associated with the Bible. Michael Sechler was a bodyguard for General George Washington during the Revolutionary War. Now that I have completely confused you with that one, let's look at the Bible and it's history, shall we? While browsing on E-bay, I decided to type in family surnames and see what came up. To our surprise, a family Bible came up when a search was done on the name Sechler. We purchased it and have it here wrapped, sealed, and put away. Before it was put up, the Bible was photographed and each page gone through individually. I took great care in keeping any further finger prints off of it and keeping it free of moisture to preserve it's already delicate condition. This pen nib was found in the folds of the Bible. It is engraved in three lines: "Ambruster & Brother Philadelphia". According to my research, there has been no such person by the name of Ambruster. There was, however, two German emigrants by the name of Armbruster, who came here in the mid 18th century that ran a printing company in Philadelphia. Gedruckt (Goddhart) Armbruster and his brother came emigrated here around 1743-44 from Manheim, Germany. They were among some of the earliest printers in the American colonies. Goddhart Armbruster started printing as early as 1747 in Philadelphia. His brother Anton (Anthony) was an apprentice under his brother for years before taking up the business himself. It is suspected, but unknown for certain, that they may have operated the business together between 1748 and 1753. Goddhart went back to Germany and died shortly after around the end of 1753. In 1754, Anthony Armbruster struck a partnership with Benjamin Franklin that lasted until 1758. It is known that Franklin and Armbruster were quite good friends and on intimate terms with their family lives. Anthony named his first son Benjamin Franklin Armbruster with Franklin being the child's godfather. Anthony was thought to have been mentally unstable on many occasions and would spell his name wrong, sometimes intentionally. Franklin and Armbruster fell out of favor when financial matters went south in 1758. After several attempts to keep the printing business open on his own, Anthony sold everything and in July of 1796, he died in German town. He is buried in the Dutch church burying ground on 5th Street in Philadelphia. 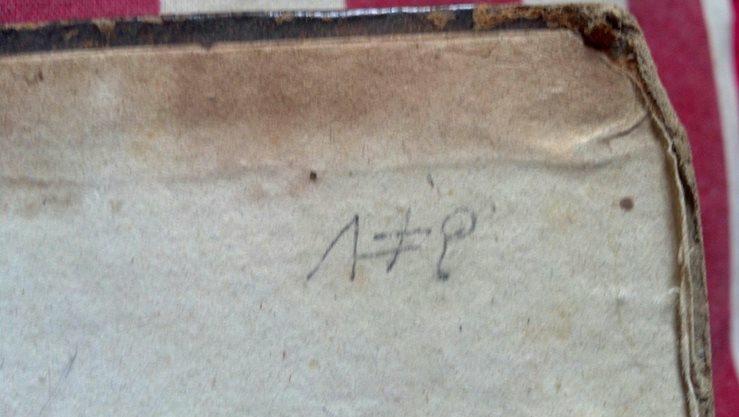 It made more sense to me as to the misspelling on the pen nib of "Ambruster" after reading about Anthony Armbruster. It is documented through his publications that he frequently came up with different ways to spell his name both in part and as a whole. I have estimated the pen nib to have been created during the time the Armbruster brothers were suspected to be working together between 1748-53. As to whether or not the pen nib was in the presence of or used by Benjamin Franklin, I suppose we'll never know. It is a fascinating bit of information about this little trinket none-the-less. Since it was most likely in German town, it makes sense that it could have ended up in the possession of another family who were also German emigrants. Perhaps they knew one another or perhaps it was left over from the change of ownership after Armbruster sold the business and was picked up by chance. George's uncle, Michael Sechler was one of General George Washington's personal guards during the Revolutionary war. It is obvious that the Sechler family was entwined in the community where figures such as Washington and Franklin once stood themselves. We can only speculate as to how the pen nib became a part of the Sechler household. As for now, it is put away safely and hopefully one day we will discover how it came into the Sechler family. If you know or are aware of someone who might know, we would love to hear the story. Please share with us through the forum or our "Contact Us" page if you can shed some light on this unique find. The bookmark found is made with a beautiful, blue, floral print, silk ribbon and a cross stitched, floral design. It is in remarkable condition for it's age. My guess is the cross stitch was added to the ribbon many years later. The front cover of the Bible had become completely detached. In the top right corner, shown above, are these symbols. If you have any idea what they may mean or think you may know, give us your ideas. We are still searching for their potential significance, so if we discover something new, we will update this page.